The ocean is wilderness at our doorstep. Standing on the beach looking seaward is an untamed environment. It may be difficult to directly observe and explore, but it is rich with life. From a fish’s point of view, not every place in the ocean is created equal. The sea floor varies with ridges and plateaus, gravel banks, boulder piles, and broad muddy basins. Oceanography and geography combine to make some locations “hot spots” for marine life to feed or breed. Conditions change. Fish move around, fishermen follow the fish in a dynamic environment. Wild fish stocks depend on the diversified balance of a wild, natural ecosystem for the capacity to support abundant fish populations, which in turn are vital to the economies of fishing communities. Society’s growing demands for energy, food and commerce are increasing pressure for industrial development in wild ocean habitats. Energy exploration, off-shore wind power, open ocean aquaculture, shipping, high-speed ferries, even commercial fishing are potentially disruptive of the ecological functions that sustain fisheries and marine life. Inshore, water quality, vessel traffic, beach nourishment and coastal development degrade the estuarine and near-coastal environments which are nurseries for our most valuable wild seafood species. Because fish habitats, fishing grounds and fishery management strategies are spatially-explicit, fishermen have much at stake in government policies guiding the emergence and siting of new industrial activities in ocean waters. Future generations’ access to plentiful seafood may hinge on planning choices we make today. How will we strike the right balance? No single government entity has executive authority over ocean resources. 26 federal agencies and numerous state agencies have authority over portions of the marine environment or commerce. Coordination of decision-making across these dozens of jurisdictions is ad hoc in most cases. Conflicting objectives around competing uses makes clear the need for a guiding vision flowing from comprehensive planning. That guiding vision must also reflect public priorities for ocean uses. Regional initiatives in Marine Spatial Planning are emerging with the Northeast on the forefront. As important, the Obama Administration has created, by executive order, a National Ocean Policy and a process for regional planning consistent with the character of regional marine ecosystems and the economic needs of local coastal communities; these regional plans are intended to provide overarching consistency across government actions and permitting. In New England: The Massachusetts Ocean Plan and Rhode Island Ocean SAMP provide guidance for state agencies. The Northeast Regional Ocean Council (NROC), a compact of the five New England coastal states and federal agencies, has developed the context for ocean planning in federal waters. In turn, NROC is providing staff and information management for the newly convened New England Regional Planning Body (NE RPB), the first under the National Ocean Policy process. 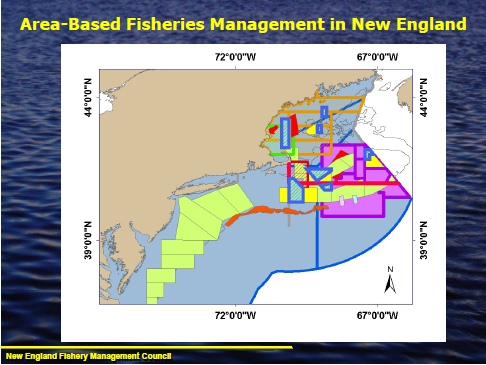 The NE RPB has begun work on a master plan for New England ocean resources which will have major implications for fisheries and fishery management. The first stage involves outreach to the public collecting data for mapping ocean uses and activities such as recreational boating. Also a series of public hearings to define goals for the planning effort to come. Douglas Grout, NH Fish & Game Marine Division, is the New England Fishery Management Council representative on the NE RPB. In the Mid-Atlantic region: In June 2009, the governors of New York, New Jersey, Delaware, Maryland and Virginia convened the Mid-Atlantic Regional Council for the Ocean (MARCO) to address ocean planning needs common to their states. MARCO has served as the basis for coordination of individual states’ planning efforts. A workshop hosted by MARCO in April 2013 provided the launch for the Mid-Atlantic Regional Planning Body (MA RPB), the second under the National Ocean Policy. Findings from the two-day workshop offered direction for development of a MA RPB work plan, a draft now in preparation. VA Marine Resources Commissioner Jack Travelstead represents the Mid-Atlantic Fishery Management Council on the MA RPB. John Williamson, Sea Keeper Consulting, serves on the New England Fishery Management Council Habitat Advisory Panel, and the Stellwagen Bank National Marine Sanctuary Advisory Council. He works with fishery leaders on the eastern seaboard promoting awareness of and participation in ocean planning. I think that bathmetryic should have some labels …. Nathalie, I agree. Does the Sanctuary office have a USGS bathymetric with place names? I would like to use the illustration listed as “Areas designated as potential for offshore wind energy leasing” for a YouTube video on the US Government’s Response to climate Change”. I want to show what the Dept of Interior has done. 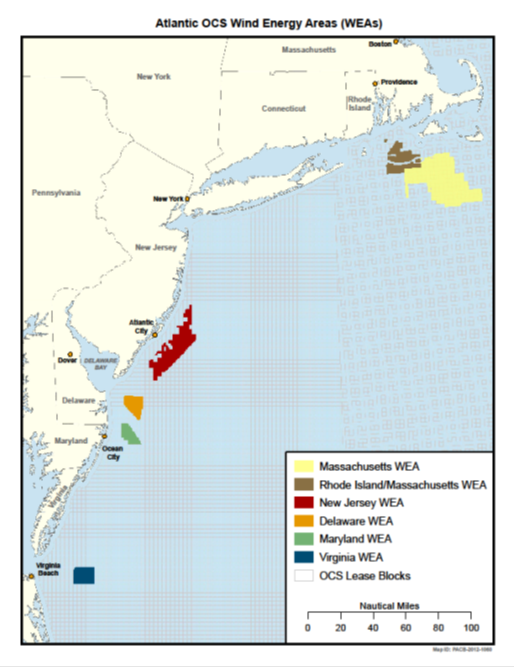 The image I like shows the 6 lease areas along the Atlantic coastline. If the illustration is yours, could I have your permission to include it? I will not be using it for any profit. If it was taken from the BOEM, please let me know who I should contact. Copyright © 2019 John Williamson | Seakeeper.